The Lord’s Church has always been a missionary church. When the Savior lived on the earth, he ordained Apostles and Seventies and gave them the authority and responsibility to preach the gospel. Most of their preaching was to their own people, the Jews (see Matthew 10:5–6). After Jesus was resurrected, he sent Apostles to preach the gospel to the Gentiles. He commanded the Apostles, “Go ye into all the world, and preach the gospel to every creature” (Mark 16:15). The Apostle Paul was a great missionary sent to the Gentiles. After he was converted to the Church, he spent the remainder of his life preaching the gospel to them. At different times during his mission, he was whipped, stoned, and imprisoned. Yet each time he escaped from his persecutors, he preached the gospel as diligently as before (see Acts 23:10–12; Acts 26). Missionary work began again when the Lord’s Church was restored through the Prophet Joseph Smith. Today the Apostles and Seventies have been given the chief responsibility for preaching the gospel and seeing that it is preached in all the world. The Lord told Joseph Smith: “Proclaim my gospel from land to land, and from city to city. … Bear testimony in every place, unto every people” (Doctrine and Covenants 66:5, Doctrine and Covenants 66:7). In June 1830, Samuel Harrison Smith, the Prophet’s brother, began the first missionary journey for the Mormon Church. 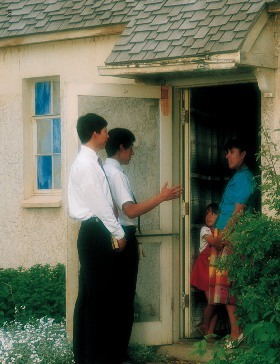 Since that time thousands of Mormon missionaries have been called and sent forth to preach the gospel. The message they take to the world is that Jesus Christ is the Son of God and our Savior. They testify that the gospel has been restored to the earth through a prophet of God (see David O. McKay, Gospel Ideals, p. 132). The missionaries are given the responsibility to preach the gospel to all people, to baptize them, and to teach them to do all things that the Lord has commanded (see Matthew 28:19–20). Latter-day Saint missionaries go at their own expense to all parts of the world to preach the gospel message.